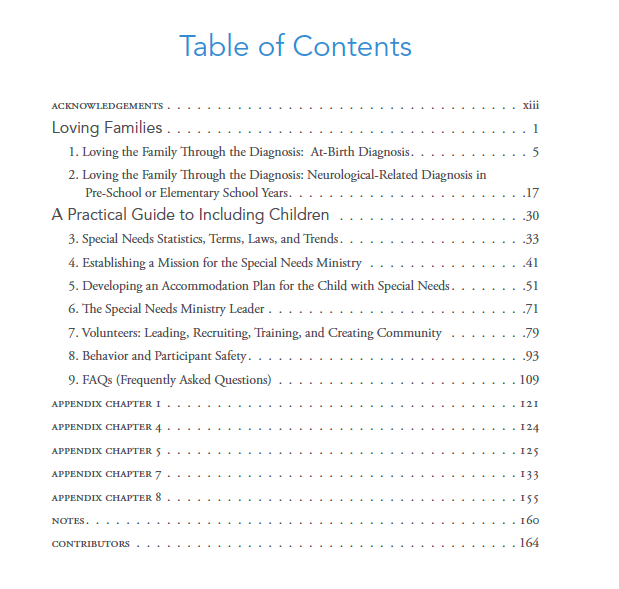 Today is the official release day for the new book, Leading a Special Needs Ministry: A Practical Guide for Including Children and Loving Families (The reThink Group, 2013). The book can be purchased through the Orange Store today. Sue Miller, Author, Making Your Children’s Ministry the Best Hour of Every Kid’s Week, Executive Director of First Look, The reThink Group, Inc.
“Leading a Special Needs Ministry: A practical Guide—the title says it all. It is very practical in orientation. The highlight of the book is that the feelings and needs of parents are focused on. In the years my son was struggling to communicate, so many people told us how to deal with his inability to speak. It was hurtful to be told he would speak if we didn’t answer him, or he is making such great progress when his speech tests had shown he was still in the lowest percentile for his age group. This was at a time when no one knew how to remediate him, including the special educators and speech therapists. Acknowledging that parents deal with their child’s needs in different ways based on their experience, knowledge and personalities is vital to a special needs ministry. Amy incorporates this important aspect into her book, giving churches valuable insight and tools to encourage parents and ministry leaders to work together. Matt McKee, CEO of ROAR and Social Media Strategist, The reThink Group, Inc.
Yolanda – Thanks for your comment and mostly thanks for all you do to help parents of children with special needs. The price and order information can be found by clicking on the link to the Orange Store in the top part of the post. The book retails for $18.99. My name is Cheri Clay and I am a Christian freelance book reviewer and a special needs church leader. I would be very interested in reading this book and as a reviewer getting the word out. Thank you. My name is Kelly Campbell and I am a parent of a special needs child (Down syndrome) and am working with our Children’s Minister to start a Special Needs Ministry. I am going to read this book. Are there other suggestions or resources you can share? Kelly – Thank you for your comment and I hope the book is helpful. Check the “resources” tab on the top this blog. There are some suggestions for a couple of other books and a training DVD among the posts listed in this category Admittedly, I don’t have posts for every good resource for church leaders (time constraints get in the way sometimes of writing up reviews). You might also want to follow “The Inclusive Church” on social media. I tend to do a better job of featuring other resources through social media because it takes less time to post a link than to write a blog post. Thank you so much for helping your church become special needs inclusive! Hi Amy! Everywhere I look the book is out of stock. Are there any plans to republish? Yes! Working on republishing. Thanks for writing Anne!